Which tapes is 12mm black on white please? The versatile Brother PT-1005BTS handheld labelling machine delivers durable labels for all-around use in the house or office. Whether it’s fabric labels for PE kits or long-lasting labels for frozen food, the Brother PT-1005BTS labeller can deliver it. This battery-powered labelling machine uses an ABC keypad as opposed to the usual QWERTY keypad. The handheld Brother PT-1005BTS printer comes in silver and sky blue. It has a manual cutter on its upper-right corner and a large LCD display on top. Below the display are function buttons, a numeric keypad and ABC characters. Tapes and batteries go at the back of the Brother PT1005BTS label machine. It features 83 symbols and 292 characters and offers 8 print styles, 6 font, sizes, and 5 frames. 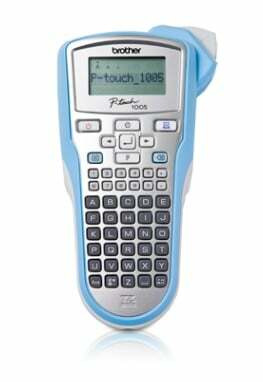 The P Touch 1005BTS label maker comes with standard 6 AAA batteries but the AC adapter isn't offered as standard and is an additional cost. It would be better if the PT 1005BTS labeller was fitted with a QWERTY keypad.